Associate Roofing is a professional roof contractor specializing in commercial and residential roofs. First of all, we recognize repairing and installing a new roof is one of the most important and expensive improvement projects to a building. Therefore, it is important to use a professional roofer to get it done right in using the correct materials for your home or building. Due to the extreme weather conditions in New England it is most important to have a sturdy roof over your head. Furthermore, it is our mission is to provide our customers with the highest quality roof products for roof replacement, repairs, and maintenance. Since our customers are our best form of advertising, hear what they have to say about our commercial roof and residential roof work. Since 1932, Associate Roofing, Inc. of New England has been serving the needs of commercial roofing and residential roofing clients. As a result, Associate Roofing has exemplified the finest tradition of an American owned and operated family business. Hence, a roofing contractor who will always be counted on in terms of product knowledge, craftsmanship, and professionalism. In addition, we believe in educating our customers on roof products and options available to ensure a satisfied customer, a job well done, and a roof to last for years to come. 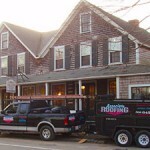 Associate Roofing is a residential roof company in the Boston and surrounding suburban areas including Boston’s South Shore, Boston’s Metro West to Martha’s Vineyard. Mike Lynch is a third generation roofer and current owner of Associate Roofing. He stands by his grandfather’s tradition of honest hard work and commitment to quality craftsmanship to build roofs that will last. We are a Licensed and Insured Roofer and General Contractor. Rest assured you are hiring the best roofing contractor in the business. Please feel free to check out our references. Associate Roofing Staff are certified & trained in all aspects of roofing. From new roof installation, repairs, replacement, and maintenance on both commercial and residential roofs. Associate Roofing is an experienced commercial roofer. Our professional roof experience ensures that you will get the quality roof your commercial business requires to last through all of New England’s weather extremes. When it comes to choosing a commercial roof contractor, it’s important to choose one with experience and the knowledge to do the job right and stands behind their work for years to come. You will find that with Associate Roofing. Associate Roofing will assist you in working with your insurance company. All Associate Roofing staff are covered for your protection.